Recycling superheroes from L-R: District 19 Councilman Freddie O’Connell, Beth Schmitt, Senior Director of Corporate Partnerships, The Recycling Partnership, Mayor David Briley, and Rob Taylor, Director of Grants and Community Engagement, The Recycling Partnership. 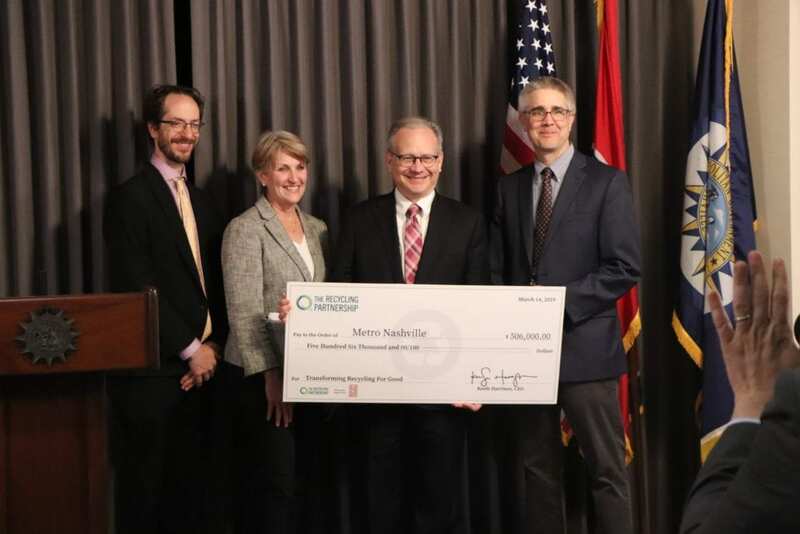 NASHVILLE,TN – Mayor David Briley accepted two checks last week worth $2.8 million to buy more recycling trucks for Nashville. Household curbside pick-ups will increase from once a month to every other week in early 2020. The money comes from the Tennessee Department of Environment and Conservation (TDEC) and an NGO, The Recycling Partnership. The NGO is supported by big companies like Waste Management, Inc including a Unilever brand of beauty products, Love Beauty and Planet. “The fun part of my job is giving out money,” said Greg Young, Deputy Commissioner, Bureau of Environment for the Tennessee Department of Environment and Conservation (TDEC). “Our mission is really to protect and improve and promote health and environmental quality throughout the state. 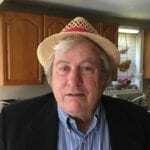 One way we carry this out is providing these types of grants to encourage the reduction of landfill waste and the reuse of recovered materials,” he said. Young noted Nashville has a significant amount of money going towards recycling and a significant amount of jobs as a result of the recycling it already does. “This grant will double the amount of recycling pickups in the city and ensure a steady supply of recovered materials that will help grow the recycling economy,” he said. The press conference last week in City Hall was emceed by Sharon Stone from Metro’s Public Works Department. She introduced Briley as a waste reduction superhero. “I was on the council when we first started recycling and ever since we’ve had a demand from certain parts of town that we increase recycling and today the city of Nashville is in position to expand curbside recycling,” said Mayor Briley. Briley thanked Public Works, TDEC, and the Recycling Partnership for helping him and District 19 Councilman Freddie O’Connell to make good on their efforts to expand recycling in the city. Metro has been working on doing that for more than a year. “I have learned in my life in Nashville if something good happens, nine times out of ten it is a public-private partnership and this is clearly one of those,” Briley said. “The most expensive part of recycling is collection so by collecting commingled recyclables like they do at the curb is what drives efficiency and increases the ease for the citizens to participate,” said Rob Taylor, Director of Grants and Community Engagement for The Recycling Partnership. They have given grants to Atlanta, Columbia, South Carolina, Iowa City, and Sarasota, Florida. “We’ve seen an increase of 125 pounds per year per household moving from the disposal stream into the recycling stream from the Partnership’s work in communities across the country,” Taylor said. In Nashville, between 12-30 tons of recyclables are recovered annually. That figure could double next year. Stone said the city’s ten recycling sites recover about seven tons every year. The big dumpsters at the Bellevue site are often overflowing or not there because they are being emptied. Stone said Public Works wants to increase the capacity of residents who do their own sorting but not with this $2.8 million. It is all going for more curbside pick-ups.